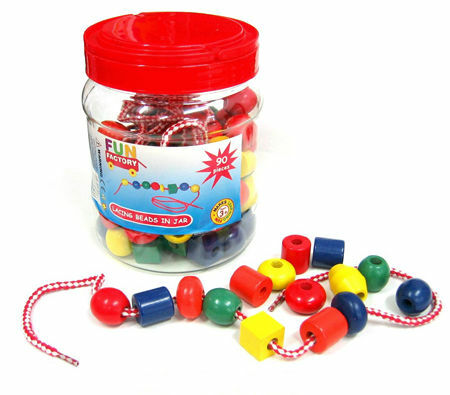 Lacing Wooden Beads In Tub is a simple classic toy which comes in a handy plastic tub with a screw top lid. This is a 90 piece set with beads of different colours and sizes and 5 x 59cm long laces with easy to thread ends. The beads are nice and smooth and easy for little fingers to lace and the tub is a great bonus come pack-up time. Material:Wood, Child Safe Paint, 5x Nylon laces. We like this because: "Simple, classic toy which little ones love to fiddle with. A big thumbs up from us ."